Characteristic Town Centre single storey house in need of Renovation. Zoned Town Centre / Commercial. The property occupies a high profile prominent location close to the intersection of Church Street with Old Church Street in the centre of Athenry Town and on a very busy street leading to the Church, Railway Station and many well established local businesses. The immediate surrounding area is largely town centre and mixed in character with both commercial and residential uses. The property occupies a prominent corner location with good prominent position in the heart of the Town. The property comprises a small compact single storey house in need of refurbishment. The property extends to 295 sq.ft and comes with a small side yard with door on to Church Street. The property offers excellent potential for retail / office / alternative uses subject to Planning Permission, however the property is currently Zoned C1 Town Centre / Commercial offering potential for such uses. 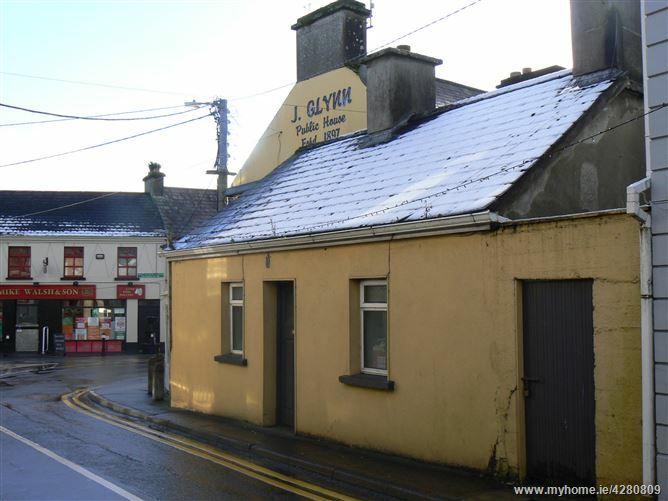 Excellent opportunity to acquire a superbly located town centre property in the heart of the popular medieval and heritage market Town of Athenry with all residential and commercial amenities at its doorstep.